The 2018-2019 LVs gathered together for the annual Midyear Retreat outside of Baltimore in Reisterstown, Maryland, January 18-20, 2019. 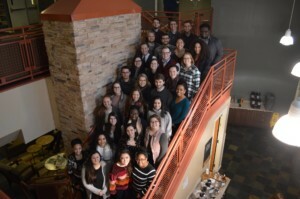 The weekend retreat, co-facilitated by LV Alums Katie Delaney, LV 12-14, and Steven Patzke, LV 14-15, centered around the LVs discerning their individual gifts and calls, as well as reflecting on the first half of their service year through the lens of faith, service and community. “The Midyear Retreat gave me the opportunity to reflect on the importance of trusting God. It’s so easy to want to control the outcome of every situation in life. However, it’s so important to remember that there is only one person in control and that’s the G-O-D, as Brother Ed would say,” said second-year LV Quaneesha Shields, who is serving at De La Salle Middle School in St. Louis, Missouri. “This retreat reminded me that it’s time to Let Go and Let God. I don’t have to worry because I know that God’s leading me where I need to be at the very moment that I need to be there. This is the beauty of being Lasallian. My heart now understands that although the road ahead may look blurry, God is shaping futures and the best part is that he always has our best interest at heart,” said Shields. Delaney and Patzke weaved the idea of a vocational call being what brings joy, builds a more just world, and gifts one possesses for the benefit of others. 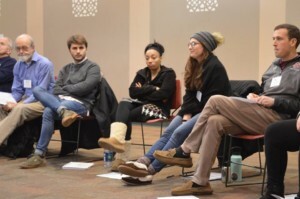 Surfacing answers to these through individual reflection, and small and large group sharing, LVs were able to consider where they’ve been and where they’re headed for the next part of their service year and beyond. Rooted in faith, service and community, the facilitators also weaved in examples of their own experiences of serving at John XXIII Educational Center in Racine, Wisconsin, and St. Raymond High School for Boys in Bronx, New York. Joined to accompany the LVs and LV staff were Brothers Ed Phelan, Michael Reis and Brian Henderson, as well as Chris Swain, LV 04-06, director of the Office of Lasallian Vocation Ministry at Christian Brothers Conference. The Brothers and Swain joined the LVs to offer support, encouragement and advice as they journeyed through the weekend. The LVs spent time together, on their own and in small groups sharing, reflecting and identifying the needs they have as they make their next decision and how they can support one another and be supported by the LV staff.